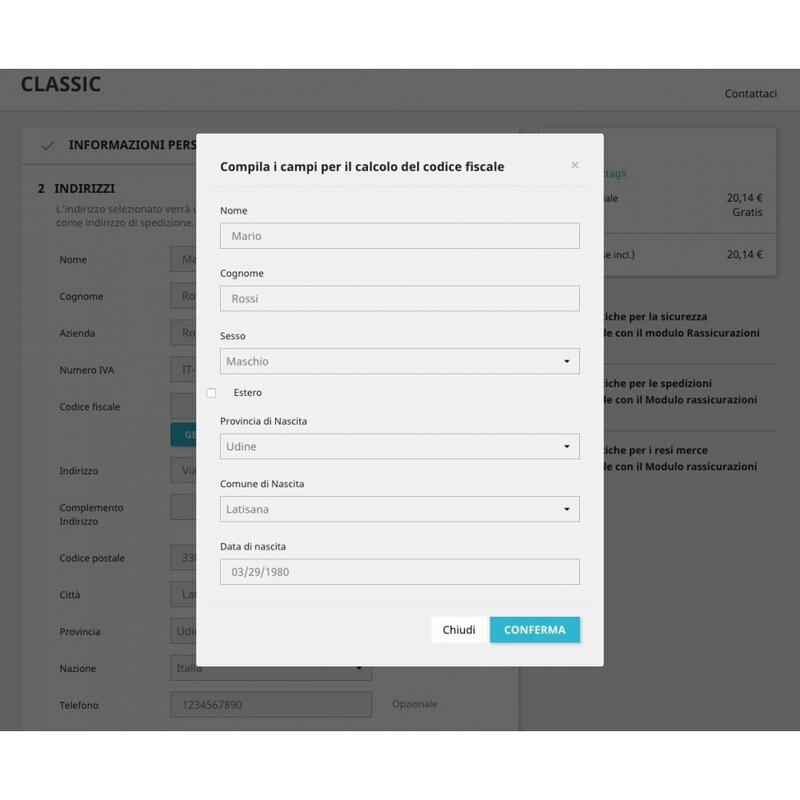 With the automatic tax code generator, during the checkout, when the customer must enter the billing information, he/she will no longer have to look for his tax code or access to an external site for the calculation. ✔️ Speed up the purchase time, calculating the tax code in a few clicks. 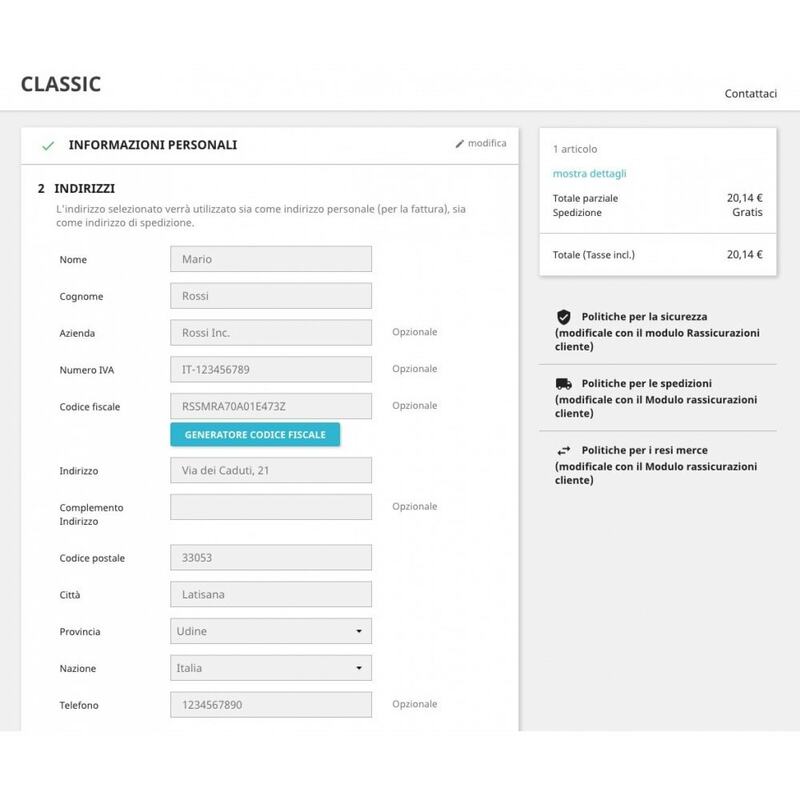 During checkout, when entering the billing information, the customer can calculate his tax code in a few seconds. configure it simply by clicking on YES. The Tax Code Generator module is compatible with all PrestaShop 1.6 and 1.7 versions. This module allows the customer to calculate the tax code, entering name, surname and date and place of birth, during the checkout phase. Possibilità di inserire un messaggio che comparirà all'interno del popup del generatore. There is the possibility to insert a message that will appear in the generator popup. Compatible with all PrestaShop 1.6 and 1.7 versions. Ce module est un outil de marketing parfait. Il permet d’envoyer des bons d’achat (vouchers) à vos utilisateurs automatiquement, après leur inscription ou commande. Ils reçoivent un e-mail d’un code unique avec d’autres informations sur la remise.